SKU: carbblocker. Category: Weight Management. Tags: Nutrilite. It is a dietary supplement that helps in controlling calorie consumption by blocking up to 500 calories from a high-carb meal. How much calories can it block? It can block up to 500 calories. How can it help with weight loss? Nutrilite Carb Blocker may assist you with your weight loss goal by inhibiting carb absorption and reducing fat storage as it promotes fat burning. 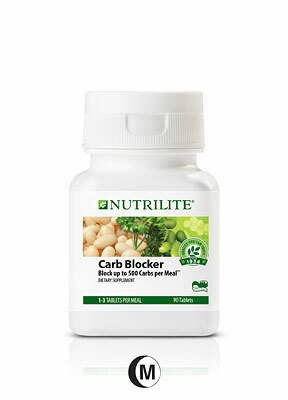 Nutrilite Carb Blocker contains fermented soy and white kidney bean extracts. These extracts block the action of amylase, an enzyme that dissolves carbs. As a result, blocked carbs just pass through your body. No. Nutrilite Carb Blocker is ephedra-free. Vim Chi is an online health shop that delivers natural supplements, which bring back your Vim (energy and enthusiasm) and Chi (vital energy to animate the body internally), straight to your door. Be sure to check out our blog posts written by our fantastic resident writers and guest bloggers.